This month is likely to be a critical month for wildfires. As we reported in an earlier post – The geography of wildfires in Mexico: the disastrous wildfire season of 2011 – 2011 was Mexico’s worst year for wildfires for 30 years. The on-going drought in northern Mexico (the worst for 70 years) means that this year’s wildfire season is not likely to be any better. May is the critical month because it marks the end of the dry season in most of Mexico, the time when the natural landscape looks parched. During the month of May, the landscape waits for the start of the rainy season, a season that is sometimes preceded by a spate of electrical storms. Electrical storms can trigger wildfires if they ignite the tinder-dry vegetation. In the first four months of 2012, there have been some significant wildfires in several parts of Mexico, including one uncomfortably close to the Guadalajara Metropolitan Area, which has a population of almost 5 million. The largest single fire in the country so far in 2012 was in Potrerillos, in the municipality of Canatlán. It damaged 112 square kilometers (43 square miles). The 56 other wildfires experienced by Durango so far this year have all been small. The total area of the state damaged by wildfires this year currently stands at about 120 square miles. Coahuila has experienced 30 fires so far this year, causing to more than 160 square kilometers. The latest three fires have been brought under control in the past few days. In the Sierra Salsipuedes (municipality of San Buenaventura) a wildfire destroyed 8 square kilometers of brush. Wildfires in the Sierra de la Madera (in the municipalities of Ocampo and Cuatrociénegas) damaged 37 square kilometers and 17 square kilometers respectively. of Yécora, Álamos, Rosario Tesopaco, Bacoachi, Quiriego, Nacori Chico and Cucurpe. Some 1,000 firefighters battled for almost a week to bring a major wildfire in the Primavera Forest (Bosque de la Primavera) under control. The Primavera Forest is a partially-forested wilderness area with hot springs. It is set in a volcanic caldera on the western outskirts of Guadalajara, Mexico’s second largest city. 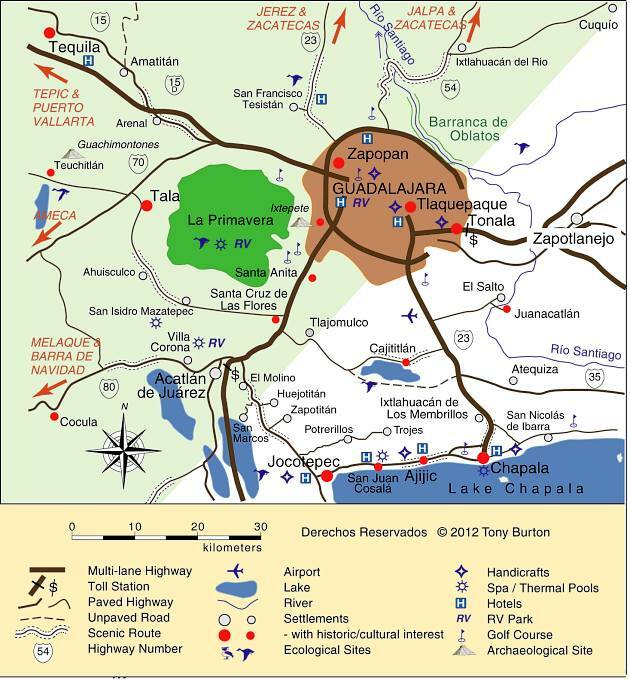 Location of Primavera Forest in relation to Guadalajara. Credit: Tony Burton; all rights reserved. Initial reports say that the blaze began on 14 April when a garbage fire got out of control. By the time it was brought under control, the fire had damaged 85 square kilometers, about 35% of it forested, making it the worst fire in the area since 2005. That area damaged is about one-third of the total area of the Primavera Forest. Residents of Guadalajara were luckier than in 2005 because winds this time blew most of the smoke away from the city, so the city’s air quality was not seriously compromised. Even so, schools in some areas were closed briefly as a precaution. The Primavera has a chequered history of protection. Most of the land is privately owned. It was declared a federally protected area in 1980, but ever since then real estate developers have nibbled away at the edges of the protected area, largely ignoring attempts by local officials to enforce zoning regulations. Several relatively small fires have damaged parts of this small state. The three most significant wildfires to date were in the municipalities of Tepoztlán, Tlalnepantla and Tlayacapan. They damaged 5 square kilometers of forest, but, because of the precipitous terrain, required the combined efforts over four days of more than 700 firefighters. The area, very close to Mexico City, is a popular weekend destination for city dwellers, and renowned for its ecotourism potential. Tepoztlán is one of Mexico’s Magic Towns. A small fire in Cerro del Palmar (in Liebres municipality) unfortunately resulted in two deaths, including that of a firefighter. More than 30 square kilometers have been damaged by wildfire this year in various parts of the state.